For 50 years, Sunbrella has been known and recognized for it's industry leader in high-performance fabrics for marine, awning and outdoor furniture. Sunbrella fabrics are a huge advancement in outdoor materials. Sunbrella manufacturers first offered outdoor fabrics for boats and marine applications but soon realized there was a need for quality furniture grade fabrics for everyday life. Sunbrella came up with soft beautiful outdoor fabrics using a new method called, solution-dying. Solution-dying is the process of adding color to acrylic fibers during manufacturing while they are in a liquid state, which allows the color to penetrate all the way through the fiber and helps create a tolerance for fading in the sun. Other outdoor fabrics use dyes that are added to only the surface of the fabric. The color only penetrates the outside layer so after time fading will occur.Sunbrella gives the example of comparing a radish to a carrot. A radish has a beautiful red color on the outside but after slicing into it, it appears white and colorless. Sunbrella fabric is more like a carrot, a beautiful orange color on the outside and inside. Sunbrella fabrics are made from 100 percent solution-dyed acrylic yarns which allows the fabric to be quite soft and touchable. Sunbrella fabrics are not only functional and ideal for outdoors but they come in an assortment of gorgeous designer fabrics which can be used indoors. Window seats will benefit from Sunbrella since they tend to stay exposed to sunlight more often. So let Sunbrella be the ideal choice for your next window seat. Sunbrella fabric is not only fade-free but these are stain and water resistant as well. This characteristic of acrylic fabrics is the key to locking in color, easy cleaning and long life. For this reason, acrylic fabric offers incredible resistance to stains, weather and wear in any application. Awning grade acrylic fabric carries a 10-year warranty against loss of color and strength. Furniture grade acrylic fabric carries a 5-year warranty against loss of color and strength. Sunbrella fabrics are manufactured by Glen Raven, Inc. headquartered in Glen Raven, North Carolina. From humble beginnings, starting out as just a small cotton mill and turning into an enormous market leader in performance fabrics, Glen Raven still maintains a global presence in the manufacturing of high-performance fabric. They supply innovative fabric solutions to a demanding set of industries, and in many markets,set the benchmark in design and durability. Sunbrella fabric is water resistant which means during the finishing process, a water-repellent finish is applied to the fabric. Normal wear and tear will reduce the effectiveness of this finish, as will cleaning the fabric. You can re-treat your fabric to give it even longer life, however, it's your choice. If you care and keep Sunbrella fabrics clean,they will not mildew. A characteristic of acrylic fiber is it will not support the growth of mildew as a natural fiber will. Remember, mildew can grow on any surface that is dirty, so to keep your Sunbrella fabrics from mildewing, you must keep your fabrics clean by using a mild soap and water.Hose off your fabric as often as you can. If mildew growth becomes a problem, please refer to our care and cleaning instructions. Sunbrella fabrics do not absorb water and are designed to air-dry very quickly - usually within a matter of minutes. We recommend that you do not machine wash or machine dry your fabric, this will often overheat and shrink the fabric. Glen Raven and Sunbrella's commitment to making a high quality product with an awareness and sensitivity to the environment. 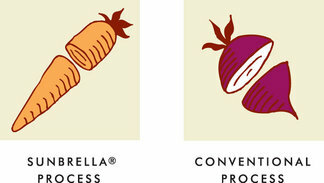 Recycling is an important part of Sunbrella's commitment to sustainability and the environment. Glen Raven has recycled Sunbrella acrylic manufacturing waste into industrial products such as felt, insulation, and padding. Some of this waste is turned into novelty yarns for use in decorative Sunbrella fabrics.